What is WalMart BigCommerce Integration? Walmart Bigcommerce Integration by CedCommerce is a powerful, reliable, and thoroughly tested extension that integrates your Bigcommerce store with Walmar marketplace. The extension enables you to synchronize the inventory, price, products, orders, and other information between your Bigcommerce online store and Walmart marketplace, resulting to you being able to attract buyers and sell your products on Walmart’s platform. Walmart Bigcommerce Integration basically allows Bigcommerce merchants to sell their products on Walmart’s platform without going through the hassles of creating codes and testing their own extension. Designed to bridge your Bigcommerce store with Walmart marketplace, the extension already comes with the necessary features to ensure the success of your business. Bigcommerce is one of the leading e-commerce platforms in the world today, serving hundreds of thousands of online merchants and businesses with e-commerce operations. With CedCommerce’s Bigcommerce Walmart extension, Bigcommerce merchants are able to extend their reach to Walmart shoppers, significantly increasing their online presence, attracting potential buyers, and generating more sales in the process. Having a reliable and smooth integration with Walmart marketplace helps Bigcommerce merchants create and/or improve their brand, thus resulting in significant growth of their business. 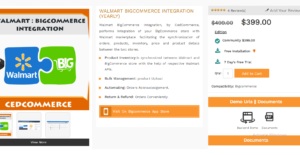 The integration makes it simple and fast for users to manage both their Walmart and Bigcommerce stores., especially with how the WalMart Bigcommerce extension automate the synchronization of product inventory of both platforms. Merchants appreciate how the extension automatically reflects the real-time product inventory between stores, whether the buyer made the purchase from your Bigcommerce or Walmart store. The same can be said when you upload new items in your inventory. The WalMart Bigcommerce integration automatically shows all the changes and updates to your product inventory in real-time. On top of that, you can upload products by the bulk. You don’t have to waste so much time uploading products individually. All you have to do is highlight the products you want to place in your inventory and upload them in bulk with just a push of a button. What Problems Will WalMart BigCommerce Integration Solve? Companies want to manage both their online store on WlaMart and BgCommerce. Companies looking to integrate with WalMart at a minimal price. Companies who wish to sell on WalMart but manage the things from BigCommerce Store. If you are considering WalMart BigCommerce Integration it may also be sensible to examine other subcategories of Best eCommerce Software gathered in our database of B2B software reviews. It's crucial to realize that hardly any service in the eCommerce Software category is going to be a perfect solution that can match all the requirements of different business types, sizes and industries. It may be a good idea to read a few WalMart BigCommerce Integration reviews first as specific services might perform well just in a very narrow set of applications or be prepared with a really specific type of industry in mind. Others can work with an idea of being easy and intuitive and consequently lack complicated features welcomed by more experienced users. You can also find software that support a broad group of customers and provide a complex feature toolbox, but that in most cases comes at a higher price of such a service. Make sure you're aware of your requirements so that you get a software that offers specifically the elements you search for. How Much Does WalMart BigCommerce Integration Cost? We realize that when you make a decision to buy eCommerce Software it’s important not only to see how experts evaluate it in their reviews, but also to find out if the real people and companies that buy it are actually satisfied with the product. That’s why we’ve created our behavior-based Customer Satisfaction Algorithm™ that gathers customer reviews, comments and WalMart BigCommerce Integration reviews across a wide range of social media sites. The data is then presented in an easy to digest form showing how many people had positive and negative experience with WalMart BigCommerce Integration. With that information at hand you should be equipped to make an informed buying decision that you won’t regret. What are WalMart BigCommerce Integration pricing details? What integrations are available for WalMart BigCommerce Integration? If you need more information about WalMart BigCommerce Integration or you simply have a question let us know what you need and we’ll forward your request directly to the vendor.